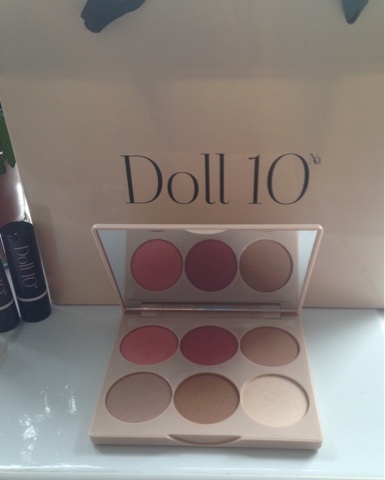 Those of you that follow me already will probably know how much I adore Doll 10 Cosmetics! I love the packaging, the Ethos behind the brand and most importantly the products. Highly pigmented and full of great skincare, these cosmetics will enhance your natural beauty without stripping or damaging your skin. Doll 10 Cosmetics was created by Doris Dalton: Doctor. Mother. Cancer survivor. Model. TV personality. Entrepreneur. Animal lover. Product developer. Mrs. America. 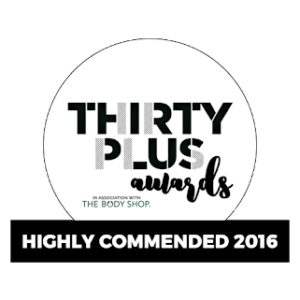 For the last 20 years Doris has lived and breathed cosmetics, developing products for some of the most coveted brands. It wasn’t until Doris fought her own personal battle with cancer that she set out to create her own line with unique products for herself….the rest as they say is history. 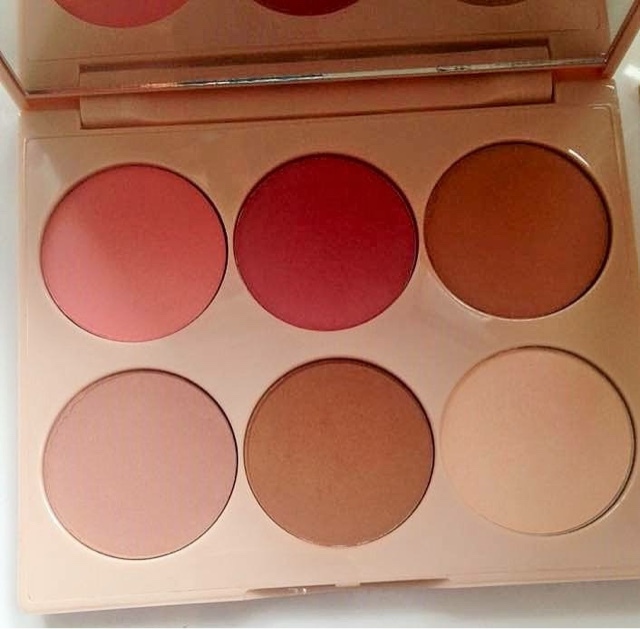 *Cheek to Chic Blush and Contour Palette. 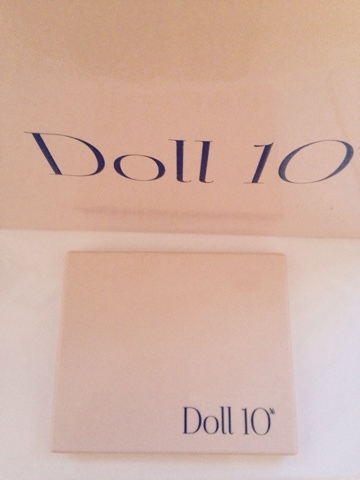 The packaging of all Doll 10 Products is beautiful, durable, yet light weight and always something that will look gorgeous on any dressing table. The other brilliant point to make is that it is no accident that all colours created within the range sit comfortably with each other. So whether you decide to be Uber trendy or Suitably Chic, there is a product within the Range to suit everyone. Doll 10 Cosmetics are certainly generous with their products, within this palette, each pan of colour is huge, making this amazing value for money. 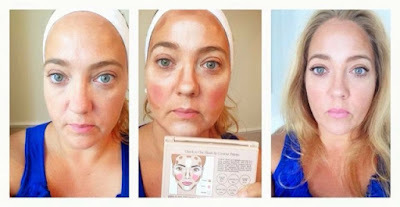 Giving you the steps to Contour, highlight and add blush to your appearance, this is a great set that will last an age and take you cleverly through all the seasons. You can adapt the amount of colour used to match your skin tone very easily. This collection of colours is stunning, it contains two blushes, a light and dark contour shade, bronzer and highlighter. 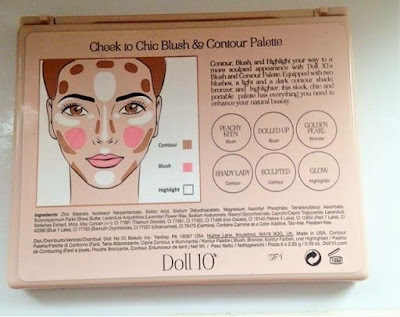 On the back of the Palette is a very handy contour guide so you can have a practice with the product. Once you get used to doing it, the process becomes very quick with professional results. I now apply mine very quickly and adapt the colours to suit my needs. I know that not everyone is on board with contouring, but please don’t discount this product. These are powder colours so if you find blending a cream more difficult, then these could be for you. Also you may just want to use them to highlight under your brow bone, your cheek, just to use as a blush and bronzer, do not feel that this is a just for contouring. I use this everyday, when I have more time, I contour, when I am just popping out, I use a sweep of bronzer and blush, its very versatile. I find that I actually do not need to top up during the day as all Doll 10 products are very long lasting, however as previously mentioned the light weight feel and slimness of this product makes it easily portable in a pocket or bag. The Palette comes with a beautiful Angled brush ( which unfortunately I do not have) but I use my eye shadow brush and face powder brush to contour and blend As I like to make my nose look slimmer, I use a small eye shadow brush to apply the darker contour shade down each side of my nose and then another to apply the highlighter down the middle. The colours also look gorgeous as eye shadows! 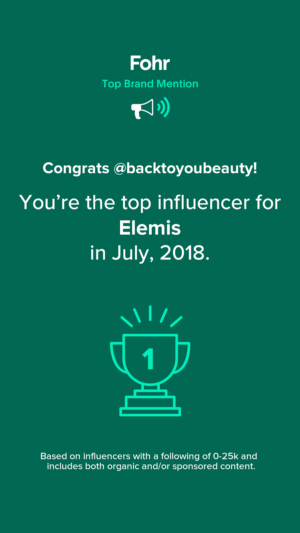 I am sure that make-up artists and bloggers everywhere would scream if they could see my above photos, however, as a busy mum I wanted to show you it was possible. I usually have about 20 minutes to get ready for a rare night out, I roughly followed the diagram on the back of the palette ( adding more or less shading and highlight where I felt I needed it) I have quite a high forhead and wide nose, so it was easy to add what I needed to hide these flaws, then using a huge blending brush, blended away….all I added was Doll 10 360 Mascara and Doll 10 Heart Throb lipstick. 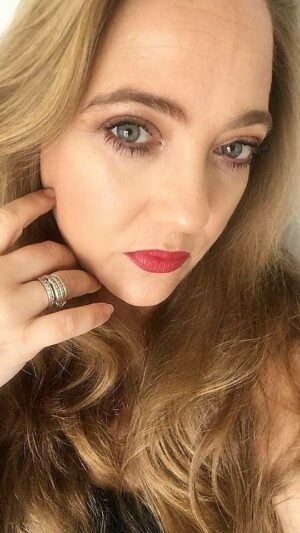 I like quite a highlighted, bright look but its very easy to adjust to suit you. 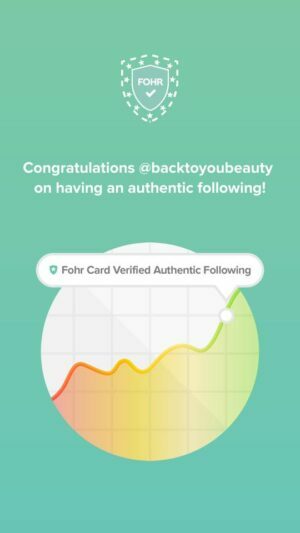 I would love to hear your thoughts n this blog, please leave me a comment below or Follow me on Twitter & Instagram. "Brand new Decleor Product Launch!….Its an Aurabsolu must have!!" Thank you for your comment Anne-Marie, i really appreciate you taking the time to write to me. Such a lovely compliment too!